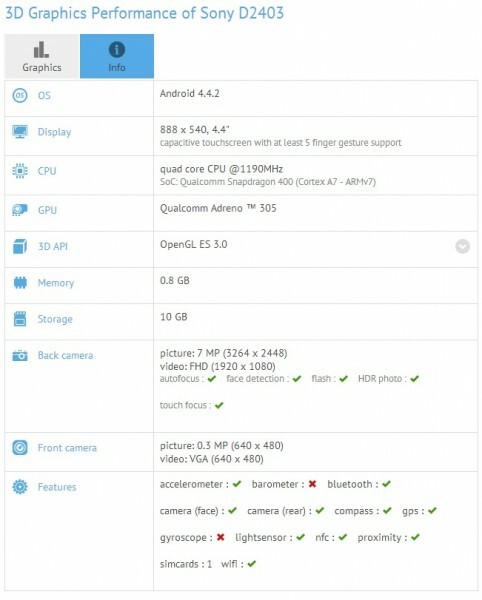 A new Sony smartphone has popped up on GFXBenchmark’s database and the listing reveals its specs. The device in question here is the Sony D2403, which is similar to the Xperia M2 (D2303/D2305/D2306). The Sony D2403 features a 4.4-inch qHD (960x540p) display and it’s powered by a 1.2GHz quad-core Qualcomm Snapdragon processor, which should be the Snapdragon 400 with an Adreno 305 GPU. There’s 1 GB of RAM and 16 GB of internal storage, which seems surprising for a device of this caliber. On the camera front, the listing reveals an 8 MP camera on the rear and a modest 0.3 MP front facing camera. The device runs on the latest Android 4.4.2 KitKat. The specifications do seem similar to the Moto G but it also betters the Motorola smartphone in some departments. The most important thing to make or break this device will be the pricing, which Motorola got spot on with the Moto G and the recent Moto E. We have no clue when (and if) Sony plans to announce the device but as always we’ll keep you posted.